The Islanders signed John Tavares to a three-year entry level contract on Wednesday. 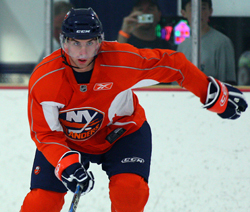 Tavares was selected by the Islanders first overall in the 2009 National Hockey League Draft. Tavares, a native of Oakville, Ontario, played in 247 career Ontario Hockey League games over four seasons, compiling 215 goals and 218 assists for 433 points. His 215 tallies surpassed Peter Lee’s former OHL record of 214 goals, which Lee held for 33 years. In 2007, Tavares was named the Canadian Hockey League Player of the Year, after breaking the OHL record for goals in a season with 72, a milestone previously held by Wayne Gretzky. Tavares played in 38 career OHL playoff games, recording 20 goals and 36 assists for a total of 56 points. Last season, the 19-year-old center, led the OHL in goals (58) and points (104). Tavares recorded 50 points (32 goals and 18 assists) in 24 games after he was traded to the London Knights about halfway through the 2008-09 season and tied for the league lead in power-play goals with 14. Tavares also finished ninth in OHL playoff scoring with 10 goals and 11 assists for 21 points. Tavares won back-to-back gold medals with Team Canada at the 2008 and 2009 World Junior Championships. He was named the 2009 tournament MVP and World Junior Top Forward. Tavares tallied eight goals and seven assists for 15 points at the 2009 Tournament to complete his all-time tournament scoring marks at 12 goals and eight assists for 20 points. His career World Junior goal total of 12, ties him with fellow Canadians Eric Lindros and Jeff Carter for most goals in a career at the World Junior Championships. Tavares is the fourth number one overall pick selected by the Islanders. In 2000, the Islanders selected goaltender Rick DiPietro first overall. Denis Potvin was picked first overall at the 1973 NHL Entry Draft and in 1972 the Islanders selected forward Billy Harris.